I want to make some noise with this post!!! This tutorial is about adding music and sound capabilities to the Freescale Freedom board, and to have a lot of fun with it :-). I need this ability for a larger project working on for a while. But I thought I share that sub-part how to play sound files. 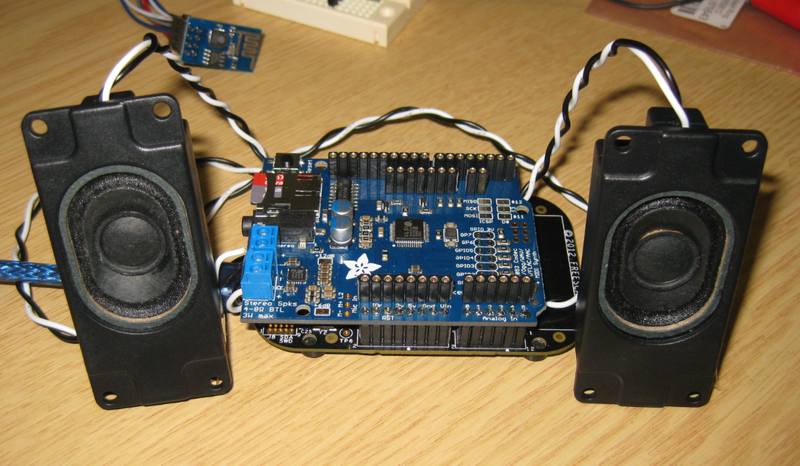 So with this tutorial I can turn my Freescale Freedom board into a music or sound player :-). And adding sounds is a cool way for any project, and as the music is stored on an SD card it fits easily hours of music or sounds. Adafruit Music Maker Shield (Part Number #1788) has the VLSI VS1053B encoder on it, and comes with a stereo amplifier (https://www.adafruit.com/products/1788). Adafruit has a version of that shield without the amplifier too (https://www.adafruit.com/products/1790). 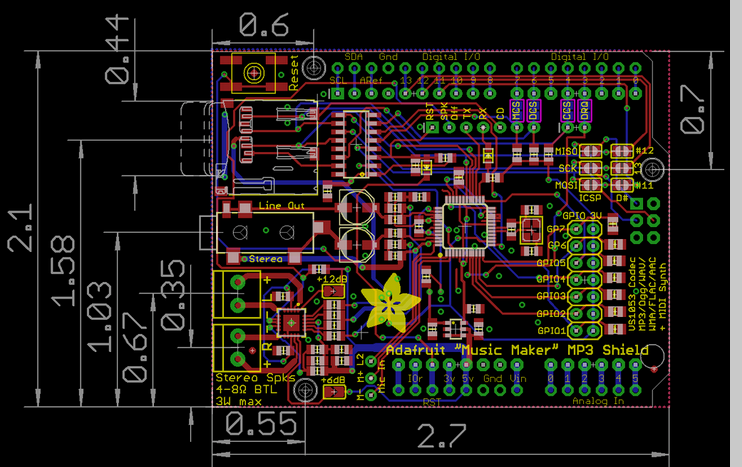 Or you can use any VS1053 board plus SD card adapter for this project. Adafruit 3W 4 Ohm Speaker Set (Part Number #1669) (https://www.adafruit.com/product/1669). This is an optional part, you can use the line out/headphone connector too. Eclipse with Processor Expert. You can use either CodeWarrior for MCU10, Kinetis Design Studio or your own DIY Eclipse Tool Chain. 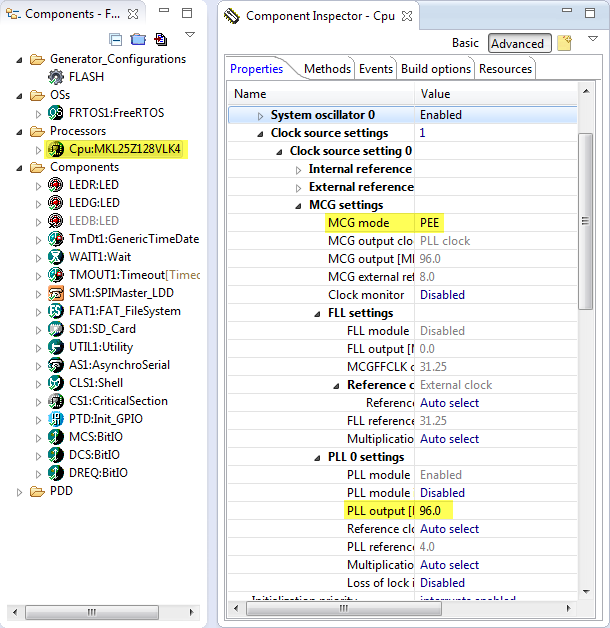 Extra Processor Expert components from https://sourceforge.net/projects/mcuoneclipse/, see “McuOnEclipse Releases on SourceForge“. In this tutorial I show how to play MP3 (or any other supported) sound files with the shield, using the FRDM-KL25Z board with Eclipse, GNU gcc and Processor Expert. You should be able to apply the instructions to any other board or IDE too. 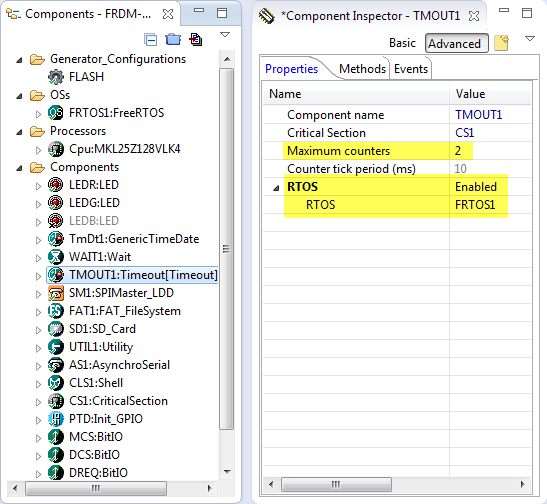 FreeRTOS realtime operating system. This is an optional part, but makes everything easier, e.g. playing files and still doing other work or serving a command line interface. FatFS (FAT File System) to read from the SD card. This is used to read the sound files from the micro SD card on the board. Shell component to implement a command line interface. With this I have a serial connection to the board (SCI over USB, using the OpenSDA debug chip), can change the volume, play files, etc. SPI (SPIMaster_LDD) is used to communicate both with the SD card and the VS1053B, sharing the same SPI bus. At the end of this tutorial there is a link to the complete project on GitHub. 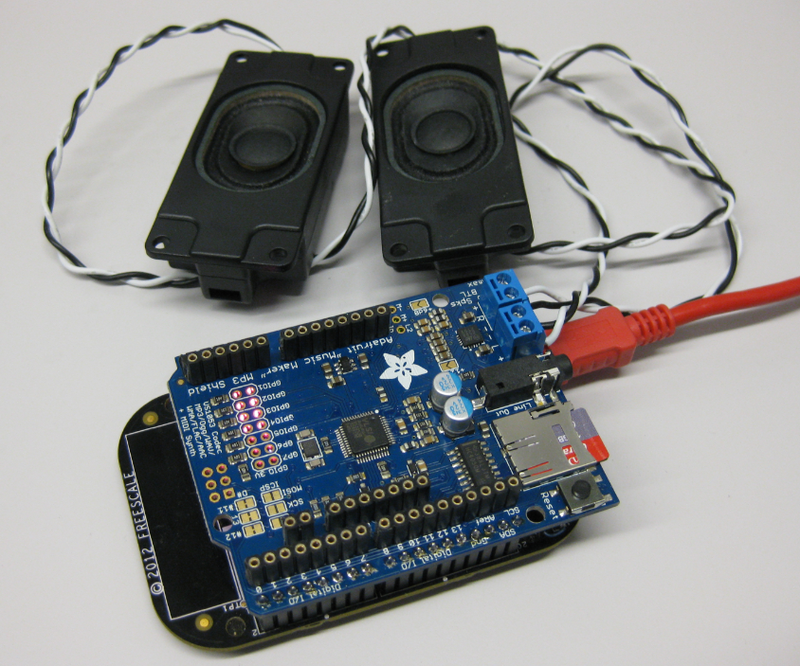 The Adafruit shield comes with integrated 3W amplifiers and has a head phone/line out. 3W/4 Ohm speakers can be directly attached to the shield. Otherwise the line out can be used to connect to an amplifier. The shield has the VLSI VS1053B codec chip on it, able to play Ogg Vorbis, MP3/MP2/MP1, MP4, AAC, WMA, FLAC, WAV/PCM, MIDI. I’m using it with MP3 files which are read from the micro-SD card socket on the board. 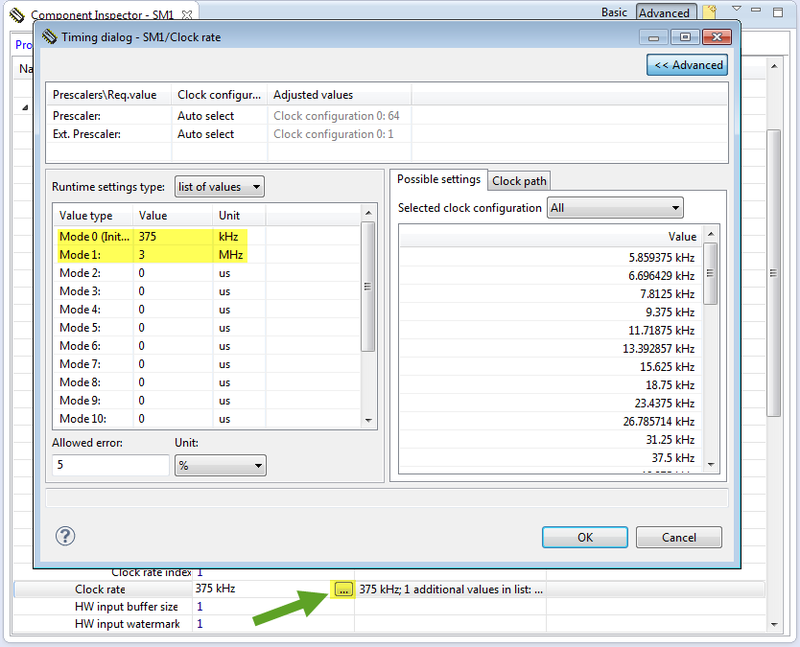 VS1053B has a serial and a SPI interface which does all the encoding and heavy work. The SD card has all the needed level shifter, so it would be possible to use that shield with 5V logic too. The picture below shows my board with headers mounted. If you plan to add more boards to your project, I recommend to use stackable headers instead (https://www.adafruit.com/products/85). This step depends on the IDE you are using. For Kinetis Design Studio use the menu File > New Kinetis Design Studio Project, then select the microcontroller of your board. Make sure that you select Processor Expert as option for the project. 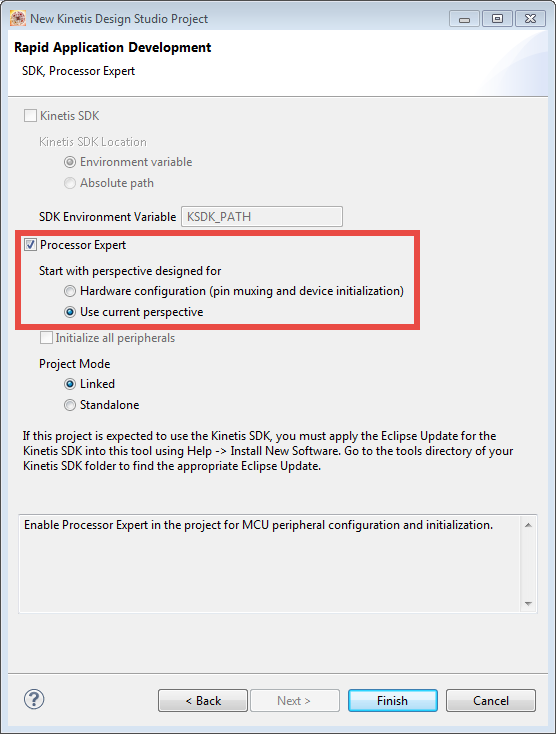 ❗ You cannot use the Kinetis SDK, as it breaks compatibility with all existing Processor Expert components :-(. 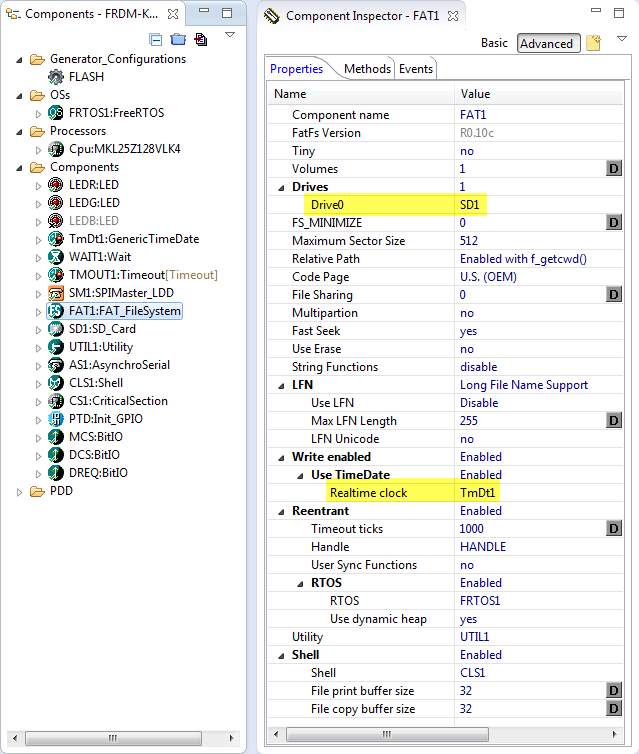 Technically it would be possible to use the SDK, but it would be much more complicated to build such a project, as you cannot use all the McuOnEclipse components. 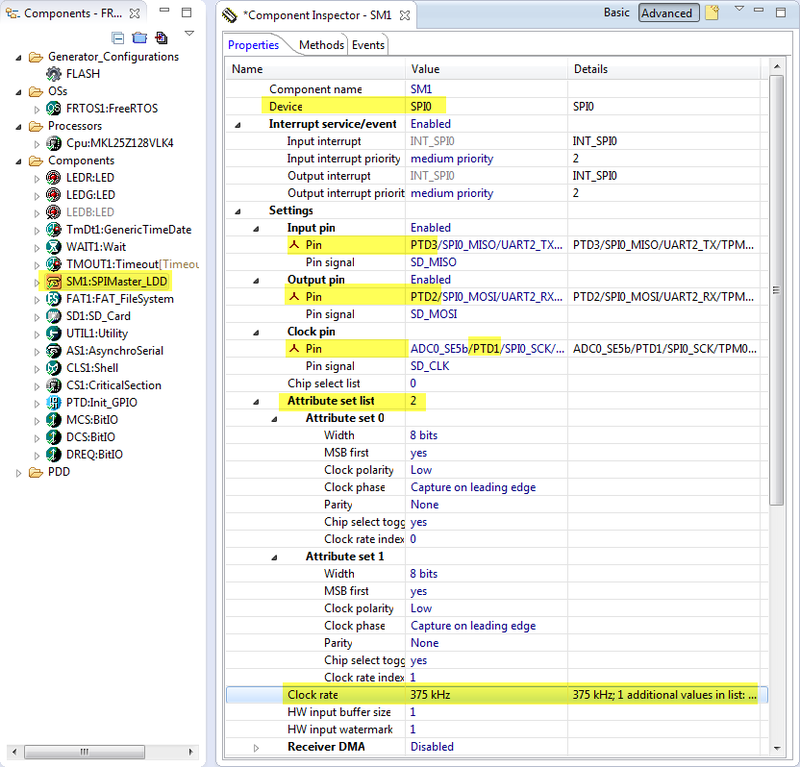 I have made most of my components compatible with the Kinetis SDK, but all the built-in Processor Expert components (BitIO, SPI, SCI, etc) are *not* compatible with the SDK. In this section we add and configure the Processor Expert components used for this project. Some components will add more components (WAIT, UTILITY, …) which I do not need to discuss here, as they can use the default settings. This completes the CPU component setup. To show status information, add LED components to the project. For the FRDM-KL25Z I add the Red (PTB18) and Green LED (PTB19). I cannot use the Blue LED (PTD1) as it would conflict with the SPI clock pin. Having the shell component in the system allows me to add command line functionality to most of my components, including the FreeRTOS or the file system (FatFS). OnActivate(): this hook is called before accessing the SPI bus. A perfect place to use a semaphore/mutex to make sure mutual exclusive access to the bus. OnDeactivate(): this hook is called after releasing the SPI bus. Here I can release the semaphore/mutex again. OnBlockReceived() is called after a successful SPI block transfer, when I have received the data. I need to check a flag this way to wait until the transaction is over. I can configure the two clocks using the ‘…‘ control (klick into the clock rate value) and configure it to use a list of values. The question is: which values? 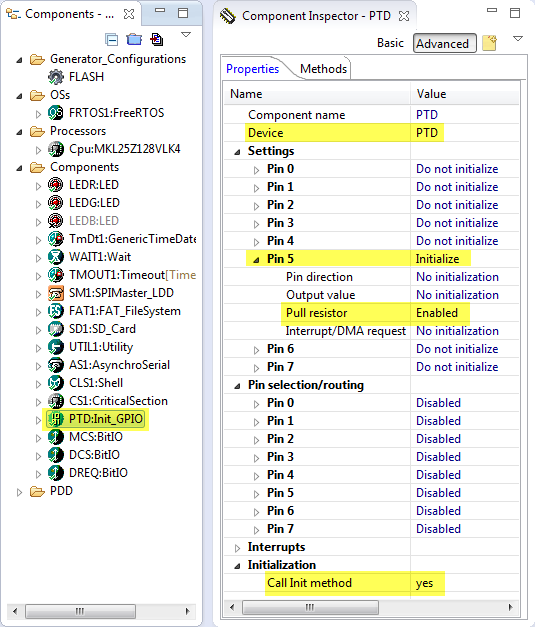 DREQ: this is the VS1053B data request interrupt pin. I’m not using that pin so far, but I connect it to an input pin for now, and could use it later with an interrupt pin. Application.c and Application.h: entry point of my application, initialize the modules and starts the RTOS scheduler. Shell.c and Shell.h: this implements my command line interface. 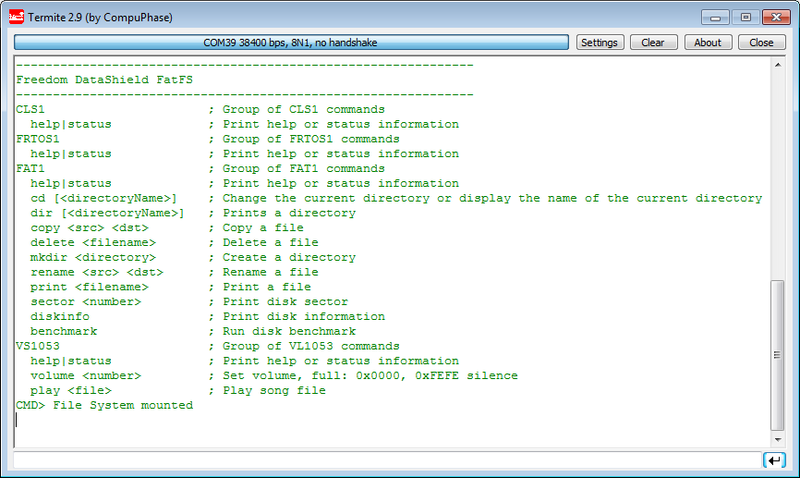 The command line parser is implemented as RTOS task. VS1053.c and VS1035.h is the driver to the VS1053B device with a command line interface to play files or to check the status of the device. * \brief Event hook handler, called from an interrupt when we have received the MISO SPI data from the device. 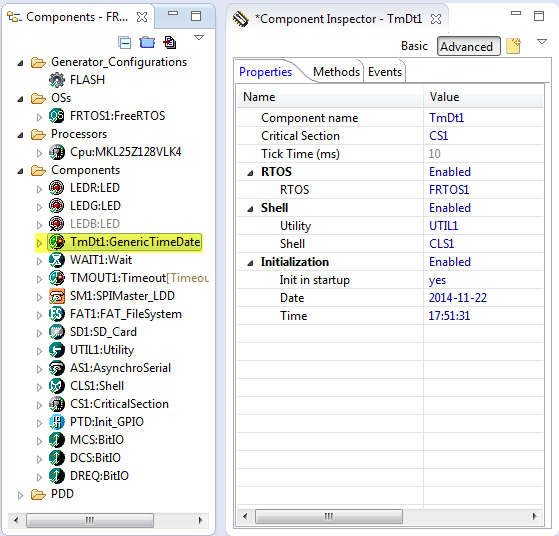 Line 102/103: From the RTOS tick interrupt hook, add ticks to the timeout module (for the timeout handling) and ticks to the TimeDate driver. Line 149: Forward SPI block transfer complete. Line 167: Forward SPI bus activation event. Line 185: Forward SPI bus deactivation event. **         interrupt] property is set to 'Enabled'. **         the ReceiveBlock method is enabled. **                           as the parameter of Init method. That’s it 🙂 Time to compile and try it out! I can list the status and registers of the device. sets the volume level for left and right to 0x20. 0x00 is maximum volume level. With this project, I can make some noise and impress my family with HAL9000 and other geeky sounds :-). The shield has even more capabilities: it would be possible to record sound and store it on the SD card. Or transform it into a MIDI drum machine. The potential is really huge, now it is all about using the Wave Shield for the next project: A Halloween scream box? (sorry, too late! But what about a Christmas scream box?) A talking clock? Or an arcade machine? I have many more ideas, will see ;-). 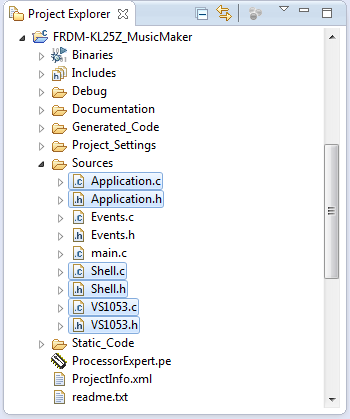 The sources and project is available on GitHub: https://github.com/ErichStyger/mcuoneclipse/tree/master/Examples/KDS/FRDM-KL25Z/FRDM-KL25Z_MusicMaker. This is a Kinetis Design Studio project, but can be easily ported to other tool chains (see Export and Import Processor Expert Component Settings). This entry was posted in ARM, Boards, CPU's, Eclipse, Embedded, Embedded Components, FatFs, FreeRTOS, Freescale, KDS, Kinetis, KL25Z Freedom Board, Processor Expert, SPI, Tips & Tricks and tagged arm gcc, Building, Eclipse, Embedded Component, FatFs, freedom board, FreeRTOS, Freescale, Kinetis, KL25Z Freedom Board, open source projects, Processor Expert, software, software project, technology, Tips&Tricks by Erich Styger. Bookmark the permalink. Im guessing my FreeRTOS task system is busy doing something else (maybe reading the data from the usb memstick……) and thats why I get these wait periods between but no… actually I read from the USB a block before I write the block to the SD card, so it shouldn’t be the HOST task… Is there a way toimprovethe lattency with the SD card? My chip doesn’t use SDHC so this wouldn’t be an option, I tried only running the tasks involved (usb host, from the USB MSD example and this task that copies the files) but it didn’t improve anything actually it remained the same. As always it’s really nice to have your work as a reference,I hope Freescale acknowledges it someday and give you the recognition you deserve! Hail to the King! you might have a look at your task priorities. I have not faced any performance issues in my setup so far. But for sure USB adds some more load to the system. In my particular case, I’m playing MP3 files from the SD card on my Sumo robot, and it does have USB CDC included as well. Again no issues, and I’m only using a 3 MHz SPI clock. Not sure if this helps, but I hope that this gives you at least a data point. Thank you foryour response, it’s always really appreciated. Regarding my task priority, they are all at the same “tskIDLE_PRIORITY+1”.. I suspect it could be more tweaked and priority could be given at specific times but from my experience with this setting, giving a better priority to a task, this task only gets executed and all the other lower priority task start to “starve”. I guess the higher priority should lower its priorities itself to give room for the other tasks but then it becomes more of a puzzle to manage. Also, I have other tasks, like I2S playback and I2S recording that are running, also running multiple I2C IO expanders and SPI IO expanders, etc. Anyways, would you recommand running at higher priority and if so is there any good tutorial around? 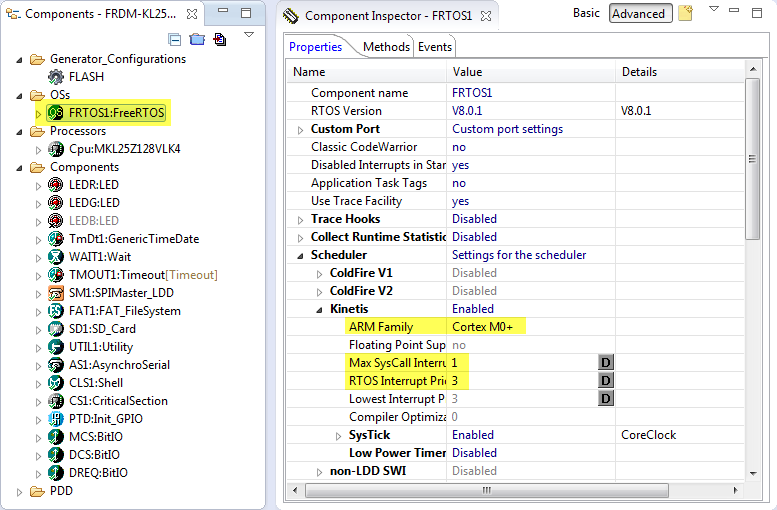 I know I tried looking on FreeRTOS website for documentation but its not so clear and the exemples are limited. I tried using a 24MHz speed to write to the SDand it gave me better results: instead of 8us delays between each 4 bytes bursts, I now have 1.5us. Now, it seems it’s the time to read onthe USB MSD that is making the file transfer take time (2m25s for 5.85mo), I have 10ms of waiting between each write to the SD card. It is obviously the time FAT1 module is taking to read the 512 bytes on the USB MSD but this seems awfully long for only 512bytes 😦 I will try with larger block sizes maybe it will help. I just thought I had to mention this bug but me, I’m using the K20D50 config and it’s working ok, I think I had to edit some generated files for it to work and not use the generated ones.. but I think I also reported that bug in another post. no, that bug is new to me :-(. first of all thanks for another grate tutorial! I used this one for trying to configure and SPI component with the kl25z and I have some problems. for what I can figure it seems from the scope that the clock is ok and the component is sending the data correctly but when I get it in the FW I get wrong data. the bottom line is I dont get the same data in the FW as the one being sent by the component. Do you have any clue about what could be the reason? Thanks in advance and also for all the greate tutorials you wrote!! it realy helped me getting started as a new progremer on the kl25z. not sure what the exact problem is. But with SPI problems can happen if the bit order (MSB or LSB first?) is not correct. 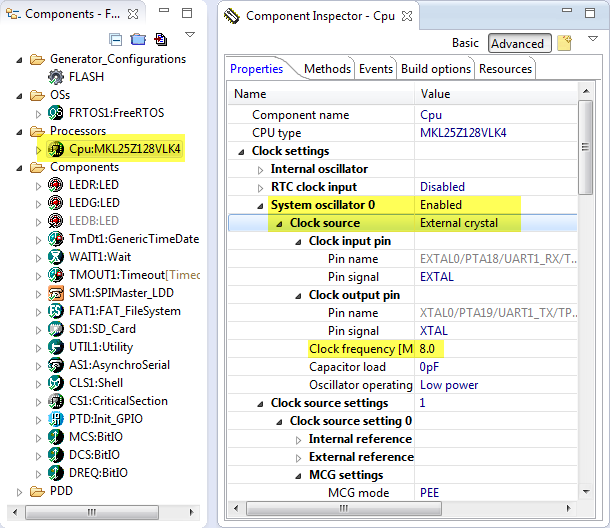 The other thing is clock polarity and phase (see https://en.wikipedia.org/wiki/Serial_Peripheral_Interface_Bus) (clock phase setting in the component). You might try the other phase setting if this changes things for you. The other advices is to try with a lower SPI clock. And to check the voltage level of the SPI signals if they reach 3.3V. I will try to explain my problom in a more derail way. I am using the kl25z and the KDS with PE. I have the MAX31855 Thermocouple-to-Digital Converter that conects to the board and comunicate with it throw the SPI. 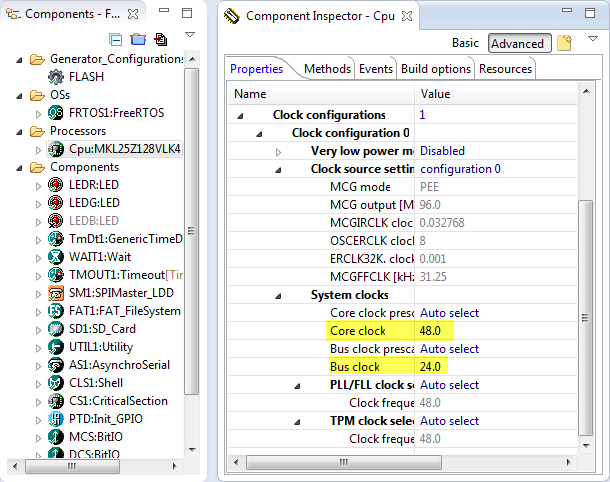 I checked the datasheet and it is MSB first and I also checked the clock polarity and phase. I’m using clock rate of 500k when the component datasheet say it can go to 5M. when I try to comunicate to the device I get what seems as not the correct data I should recive, but when I connect a scope I can see that the MAX31855 sends the data correctly… (I mean that if the digital result I am getting was as what I see that the MAX31855 sends according to the scope it would have been ok). I saw in this tutorial you can define I/O buffer size whitch I don’t have in my PE properties, and I thought about trying to change in order to make it work. can it be the reason? if not can you think of another place where I can look for the problem( I am trying to find it for 3 days already… 😦 )? Thnk you so much! I rely appreciate your help! what other SPI component are you using? If using SPI in interrupt mode you should have a buffer allocated for it, otherwise it might not store all the data in the buffer. Thanks for all the help and again for this tutorial! Ah, yes, that’s someting I was running into on some devices too. I have a quick question. What does exactly the board send to the encoder? the parsed MP3 file without any other modification? Could you please help me up with this error? I quickly retried that project on GitHub (see link in this article) and it works for me. That worked. Thanks a lot for your quick response. Auto initialization was disabled. Is this error of any significant impact as I read in one of your responses ( https://community.freescale.com/thread/389526) that it is not. However I am still not getting anything on the terminal. I believe this might be a reason. Could you guide me as to where could I be going wrong. To give you a brief description on my project. I am trying to replicate this project on FRDM K64F. I am using PE Micro 10.0.10 with KDS 3.2. I have followed the same steps that you have described with minimum changes such as pin configurations. You can simply ignore that RESET SCRIPT message (P&E confirmed that too). What do you mean that you are not getting anything on the terminal? Are you using the UART-to-USB bridge over the K20/OpenSDA? You need to make sure you are using the correct pins for this. working on my data logger project on the K22, and while the SD card works fine, I am having trouble also using the SPI for my port expander. I’m doing the semiphore like you do here, but That doesn’t seem to be the problem. 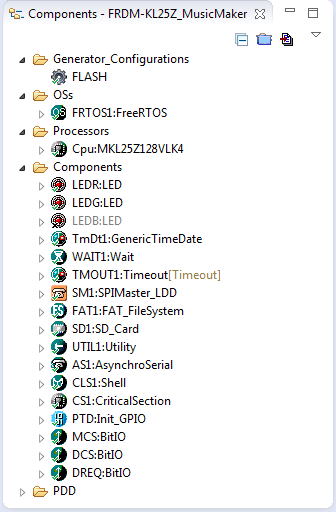 When I call my routine to shift out one byte with a different chip select, my Saleae Logic and an O-scope both say the SPI clock and MOSI doesn’t Move. But SPI is very busy when logging a file. It doesn’t matter where I call my routine from, the SPI doesn’t want to work with it, I even can put it in a loop in main before App_Run() starts everything and it still does not SPI. // err=SM1_SendBlock(&PowerReg,1,&sent);	// shift out the bits on the spi port. Stepping through the SM1_SendChar ends up down in SMasterLdd1_SendBlock, where it does sets 3 devicedataPtrs, and then turns on a DMA interrupt. the next time through it thinks it is busy because the data never got shifted out. I’m confused as to why it felt like it needed to use DMA to shift out one char, and also why it never did shift it out. The component is internally using DMA interrupts, that works fine on my side. So I don’t think this is the issue. If you set a breakpoint in SMasterLdd1_Interrupt this interrupt gets fired? I would check if all the interrupt service routines calling RTOS functions are using the FromISR() variants. And can you check that your interrupt priorities are set correctly (pay attention to the BASEPRI boundary. I would try to use the SPI on the port expander if it works (without the SD card)? 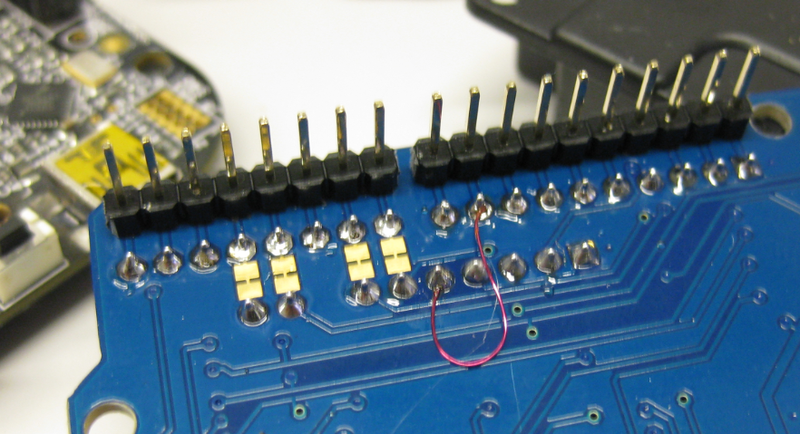 The SPI port expander had worked fine before I added the FATFS. I had let the SM component handle the chip selects. Once I added the FATFS, the SD component has to handle the chip select to the SD card so I assumed that I would also have to handle the chip select to my port expander manually instead of letting the SM handle that chip select. I made a new project that did not include the FATFS, but does include the exact same code for the SM1 component, my Power_SS bitIO component for the SPI CS and my Powerbits port expander setting routine, it runs perfectly, hammering the SPI port exactly as expected. 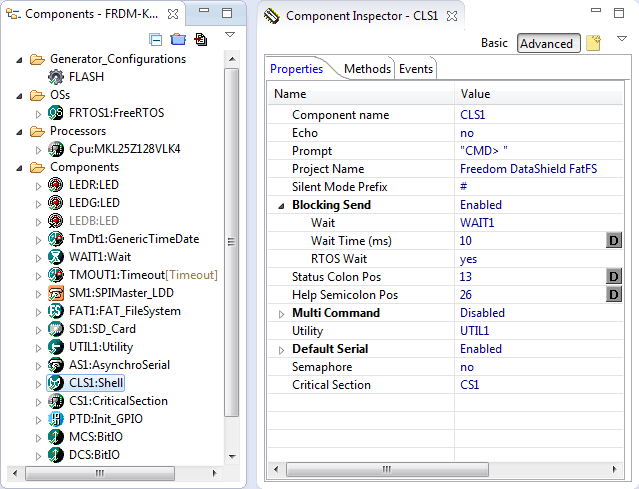 Oh, the new project that works the SPI does not include the FreeRTOS component. 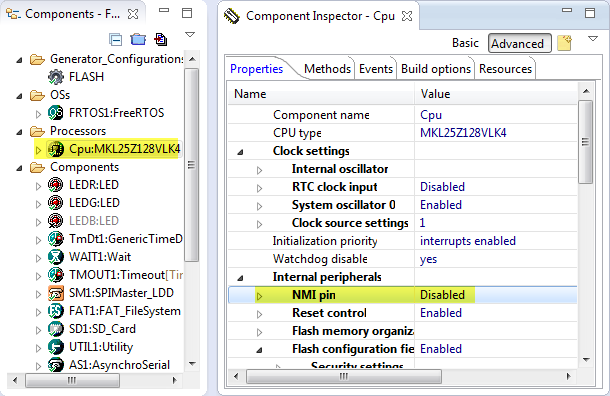 Keep in mind that with using the RTOS, interrupts are disabled until the scheduler runs. So you won’t be able to use SPI/etc which very likely are using interrupts outside of a task. Then I noticed the ‘main task’ that has the SD card stuff has a priority of tsk_IDLE_PRIORITY+1, and my power task had priority …IDLE…+0. I changed it to the same as the main task, and it WORKS. 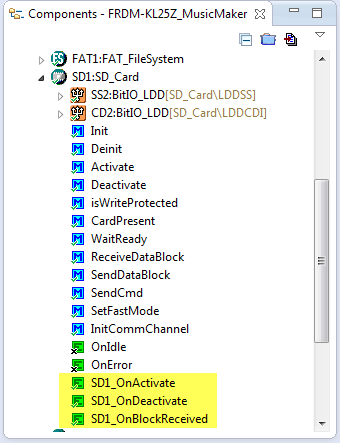 Of course now the SDcard SPI locks up on SM1_RecvChar in SD1_ReceiveDataBlock in SD1_disk_read(). I tried changing it back so the power task doesk do SPI at all, and now I am getting a Hard Fault. How do I interpret the data that the Hard Fault component put on the stack? It seems like the stacked_pc is telling me it was in RTOS code. if you get a hard fault, then something must be very wrong. Check both the stacked pc and lr (link register): one or the other points where it happens. If it is in the RTOS code, it could be a stack misalignment too or general stack problem. 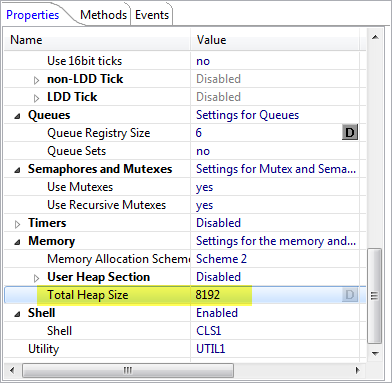 Make sure that your SD task has enough stack as FatFS needs it. 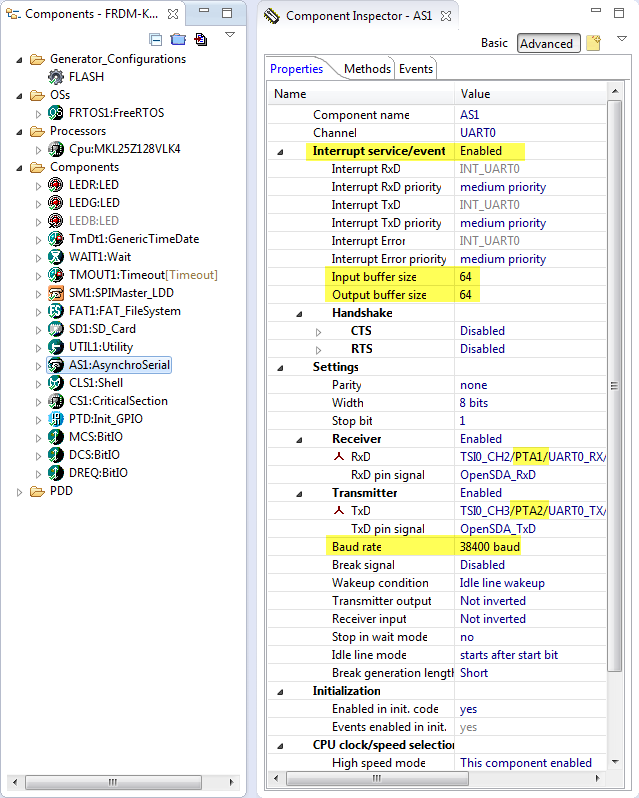 Give the SPI interrupt a high priority and make sure you are not using any RTOS calls from it. 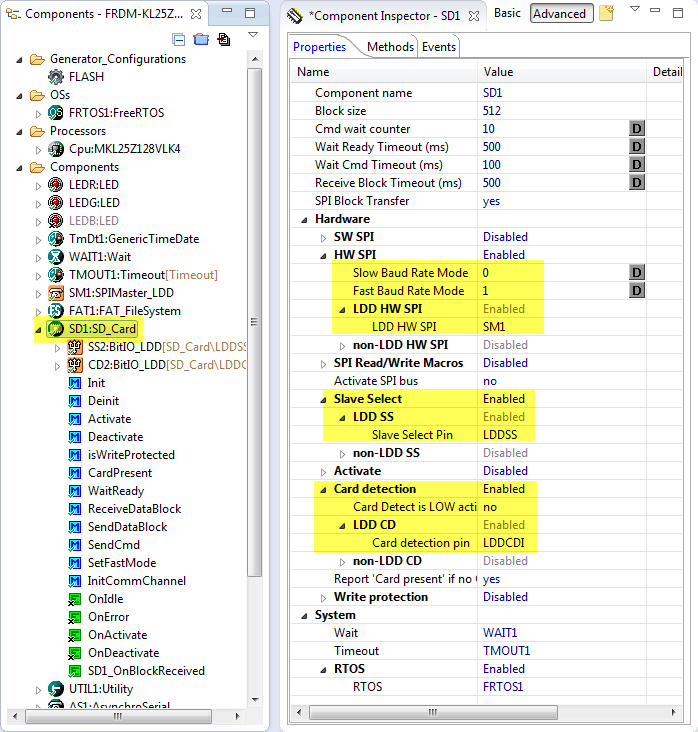 configRECORD_STACK_HIGH_ADDRESS is available in the latest FreeRTOS component (see FreeRTOS section in https://mcuoneclipse.com/2016/10/30/mcuoneclipse-components-30-oct-2016-release/). And it only does it if I make a call to my PowerBits function. If I leave my function uncalled, it executes fine and logs to the SD card every 5 seconds like it is programmed to do. can you check if sobj is not NULL? If it is NULL, the semaphore (sync object) has not been initialized somehow. I can see that the there is a ‘FAT1_sem’ block on the heap. I think that is where the sobj is. in the unlink or whatever call the sobj is referenced by ‘fs->sobj’, so that fs pointer would have to be valid too. Once into the HF handler, I cannot see what ‘fs’ or ‘sobj’ or ‘fs->sobj’ actually are anymore. yes, fs->sobj is pointing to that FAT1_sem (should be the same address). You can cast the pointer in the debugger to see what is behind it. Can you check that FAT1_sem is initialized and not NULL? The FAT1_sem is 0x20001cb0 which is a location on the heap. I have my RTOS heap set at .m_data_20000000 and it is 0xf800 in size. 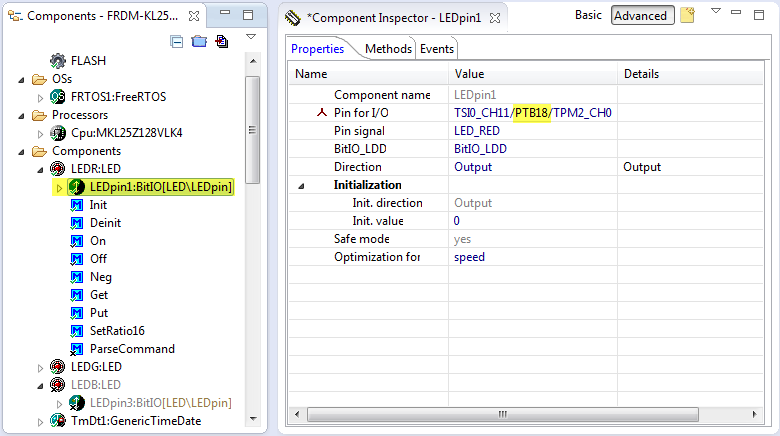 I also have a problem when I add the ADC_LDD component and try to take measurements. I never get an AD1_OnEnd event, and the AD1_GetValue16 array is all zeros. Again, it worked fine before I added the RTOS. I think I must not understand something fundamental about using the RTOS. Is there a good tutorial resource that I should be reading? The interesting part is: what is the ‘cotent’ of FAT1_sem at 0x20001cb0? Is it NULL/zero/not initialized? I tried to cast the FAT1_sem in a debug window, but I obviously do not know the right way to do that. Why is it that some structures are fully displayed in the ‘hover over’ and watch expressions, but others like FAT1_sem for me just give the structure address instead of the value of all the elements? what is the exact cast I should do in which window to make that work? You could use a cast in the expressions view. Or simply hoover over it to see the numerical value of the pointer. Or check the memory at that address. As for the books: They are for sure convenient to have them on the desk for learning the RTOS, and they contain more details as the information on the web. So yes, they are useful, and at least not priced at the level as other books. But it always depends what you are looking for. The challenge is that the RTOS is changing, and the book might not keep up with that pace. I will be trying to implement this using another FRDM-KE02Z board. Will keep you posted as to how it goes. Thanks! I’m porting your program to the Freedom KL46Z and I did it with excelent results. I’ve downloaded the Termite program and I’ve put the comands to play the music, so it’s working perfecly thanks to you. I was reading the code and I saw the funtion “VS_PlaySong”, This funtion can be used to play a song without the termite? I’m planning to do a MP3 player With LCD and navegation buttons. Please if you can tell me how to use this funtion (a very simple example) and if is not the good way to do it recomend me a good way to do it i really appreciate it. you don’t need the console, you can call VS_PlaySong() from your application too. The example is in https://github.com/ErichStyger/mcuoneclipse/blob/master/Examples/KDS/FRDM-KL25Z/FRDM-KL25Z_MusicMaker/Sources/VS1053.c. There you can see how the functions are used. Yes, I see it, but is using the shell, I don’t find the way to used it without the commands. If you help me I really appreciate it :).